Like many Notre Dame students and alumni, I recently received the Notre Dame Magazine, which commemorated Father Ted Hesburgh’s life. Father Ted died late on the night of Feb 26, 2015. I just couldn’t put this magazine down, and yesterday being Memorial Day, was such a perfect time to read and reflect on the great man. I remarked to my husband that his accomplishments and full life were more like that of 20 people! But what really stuck out for me was what he said, and how he lived his life: first and foremost, as a priest who vowed to say Mass every day. I loved Father Georgio Di Prizio’s advice to Father Ted, this in his early days as a priest. We sure felt this as Notre Dame students and alumni. He was there for us: our education, our faith and our wellbeing. He was there for so many good causes such as world peace, civil rights, the poor, and disadvantaged. This is also sage advice for anyone in our personal lives and in business, especially in today’s rush, rush digital world. Maybe this is why he could make so many decisions, and quickly. That is such a huge part of the human condition: forgiveness. No wonder he was such a successful leader and coach towards world peace. I am particularly inspired as I am dealing with health issues these days with Father Ted’s credo in facing one’s later years. 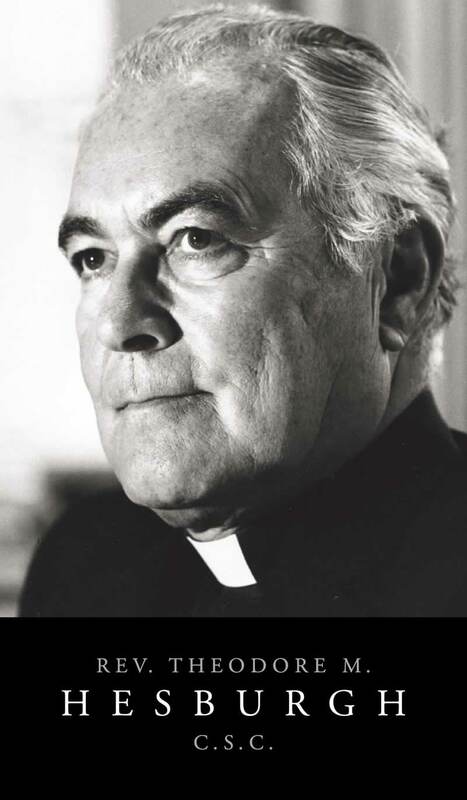 Right up to the end, Father Ted Hesburgh was a great example to us all, and I feel lucky to have been touched by him as a Notre Dame student and alumna. BTW, today would have marked Father Ted’s 98th birthday. Last Sunday was a tough one to get through as I was thinking about Dad during many parts of Mass. There are at least three places where we recall the dead. I haven’t gotten through a Mass without tears since he died now almost 5 months ago. One of my Notre Dame classmates tells me that this is part of the healing process. I hope so. Father Jim had some great comments especially regarding the Gospel reading where Jesus asks Peter 3 times if he loves him and forgives him for denying him 3 times the night before He was crucified. That is a very extreme example of forgiveness but it is a reminder that we get huge relief and energy from forgiving others, and then we’re in a great position to let God’s love really shine within us and to share it with others. This is where I thought of my dad. He must have been so forgiving since the love he held for all of us, including total strangers, was so evident in how he spoke, and in his soft, sparkling blue eyes. He said, “Ah… he is a one hell of a nice guy,” with such warmth and passion so often. Even while he was failing and had to be in the hospital and rehab, he was telling every nurse or aid that she or he was his favorite. “You’re the best,” and “I love you,” were common statements from dad. They all wanted to help dad however they could. And he always said “Thank-you,” even for the most trivial things. If there was an excuse to be grateful, he shared it. I am a little lost without my dad as he had such a deep influence on who I am. He was there for me ever since I can remember, even up to about 2 days before he died. He was bedridden at this point, an old man hardly in charge of his physical abilities. He wasn’t eating, yet he was still telling us he loved us. I know he was scared, and some of those last mornings he would waver between marveling that he was still with us, almost in disbelief that he was, since he knew he was very sick–even though he lived with the confusion that comes with dementia. He had frequent choking fits from a combination of dryness and his inability to swallow. We would take turns helping him out, and as much as he suffered, he always thanked us. I wondered how he even had the energy to thank us, but somehow he did. He was a kind man right up to his death. Yet I now see more glimpses of him as the man who pulled me out of the pool when I won swimming races, and even when I didn’t. This is the man who taught me to believe in myself and that anything was possible with God’s help. He instilled the “can do” attitude that I have on most days! I had another wonderful gift this week: it was from Mom. I was telling her how I had no regrets about all the traveling I did when I was abroad in college for a year. She told me she had no regrets about the wonderful 62 years she shared with my Dad. She is so grateful for the rich life they shared, how much he loved her and how much they traveled and experienced the world! This message came right at the end of our phone call and I could hear a sense of peace in her tone of voice. This is part of her grieving and I wonder how long she had been waiting to share? This weekend I took a walk down memory lane as I accompanied my husband to his family’s farm in Maryland. As many of you know, we have had a record amount of snow in the Washington, DC area over the last couple of weeks. I had been feeling somewhat stir crazy along with most of the local population, since other than shoveling we were home for the duration. My family lives on one of the last roads to get decently plowed in Fairfax County. In fact, it’s still not great! 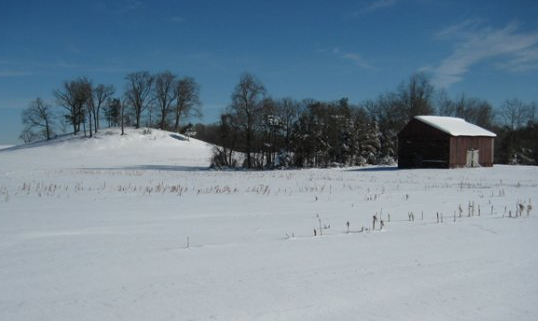 We had to walk down the driveway to the farm since we didn’t get it plowed. It’s a ¼ mile driveway, so not for the unsteady of balance or heart! It had been several years since I had visited the farm since I have spent all my time caring for my parents at their home during my trips to DC. The farmhouse is full of counted cross-stitch projects that my Mother-in-Law has created over the years. One in particular is a handsome, large tapestry which hangs in the dining room. Numerous counted cross-stitch pillows are scattered all over the house which gives it such warmth. Family pictures are the other prominent theme, and most of them date back 20 – 30 years when we were all much younger! There is a lot of caring, love and laughter in that home. The family had a new well installed since my last visit as well as a new roof. One of the large barns had blown down in a storm, and a smaller replacement barn had been erected. But mostly it was the sameness of the place that stuck with me: the house, the farm buildings, the barns, the garden plots and the sense of peace that I feel whenever I’m there. We could hear geese flying off in the distance, presumably to the nearby Patuxent River. Here is something really sweet which I almost stepped on as we were leaving. 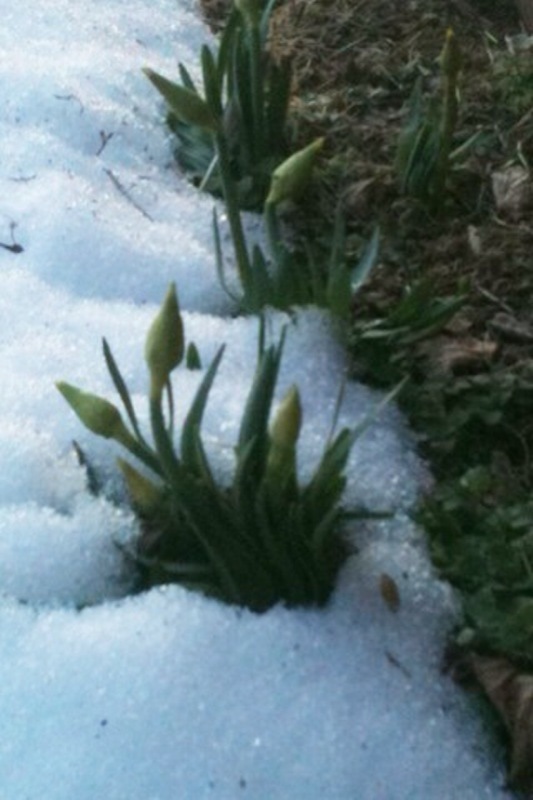 The daffodil bulbs are coming up, just as the snow is beginning to melt. I am so grateful for the small things in life. I guess Spring is coming after all! This is my second trip home since Dad died. It’s easier than the first trip since I was so overwhelmed by his absence and the first trip was only 4 weeks after his funeral. I still dreamt about him every night. I couldn’t think beyond the last couple of weeks of his life, and how he had steadily declined until he died. The dreams were vivid and I awoke in a heavy sweat. My Notre Dame sisters from my class, friends and family have been so supportive through prayers, notes, phone calls, and many shared their experiences about losing their parents. My husband listened to me talk about Dad over many dinners like a broken record: I just couldn’t stop. One classmate had a particularly hard time with Sunday church after she lost her Dad, which she attributed to the healing process. It helped to hear her perspective as I was having a hard time getting through Sunday church too. I was numb and felt sad and disconnected at the same time. I feel less sad now. On this trip, I knew I had to deal with my Mom, her loneliness and her pain. Her physical pain is bad so we don’t think about Dad as much since we’re preoccupied with keeping her comfortable. God knows we love her, and hate to see her wincing. We help her with daily living and it feels good to give back. A number of friends have said, “Make sure you grieve fully for your Dad.” “Take time for yourself.” “Be kind to yourself.” It sounds good, but who really has time for this when you still have your Mom to care for who grieves after 62 years of marriage with this man? I have a business to run, and yet I want to take care of my Mom as best I can and I live 1,750 miles away. When do I have time to grieve? When do I have time for myself? When do I have time to run my business? I don’t even have children…how do my friends with children listen and cope with all these emotions and the realities of life? After I put my night owl Mom to bed, I come upstairs where it is quiet and peaceful as there is no TV noise. I need quiet to do my work as most of it is cerebral. I need to be creative to execute what I do and yet I am so tired! I want to write e-books, and know that I write best at the wee hours. But while I visit Mom, I postpone this since I have to catch up on business during this time. 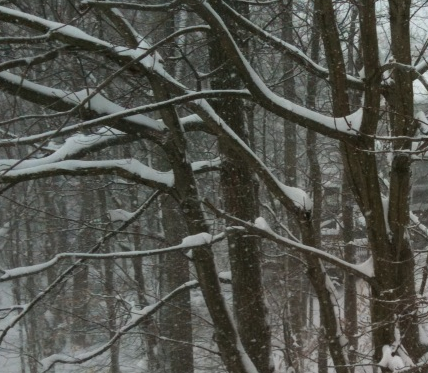 It’s cold here in Virginia and we just dug out from two feet of snow and it is snowing again. Like the weather, I know my feelings are temporary and fleeting. I am an optimist and things always work out. Eventually I will take time for myself and continue the process of grieving for my Dad. This blog helps. In the meantime I am grateful for the love and passion Dad instilled in me.